The New Casio Cash Register SES3000 builds on the popularity of the previous SE Series Cash Registers by adding a large 10 line LCD display. This allows for easier programming reporting and operation compared to previous models. It also has some other great features such as an SD Card slot so you can backup your program and save reports to it an alphanumeric customer display so the client can see the names of products as they are rung up and much more. This model has two paper rolls 30 raised department keys on board and comes in silver with a full sized black cash drawer. 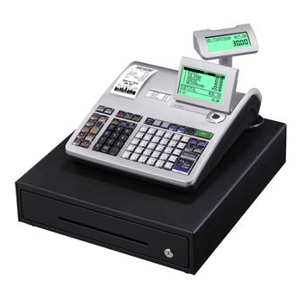 We can also programe your new Casio Cash Register SES3000 ! If you select the programming option for this Casio Cash Register SES3000, our service team will setup your Casio Cash Register SES3000 before we ship it. at no extra cost. You can email your menu to us or we will contact you to discuss what we require to make sure your new Casio Cash Register SES3000 is setup correctly .